With her unique background of elite athletic achievements and education, Ina inspires our young fencers to reach for their best in practice, school, at home, and with friends. She creates the needed environment for our students to actively engage in their own development and helps them learn from their achievements and mistakes. In this process our young fencers engage in critical thinking, develop resilience, build confidence, and take responsibility for their actions as well as take pride in their accomplishments. As IFC's ultimate goal is to see our students become successful in life, Ina's athlete-centered approach allows her students to actively participate in the decision making process of their own development as well as to influence the overall direction of the IFC Youth Program. As a result, our students learn to make informed choices and transform into leaders inspiring others. Ina has coached fencing for 16 years in the U.S. and has developed athletes to compete at the US Fencing Olympic Trials. Many of her fencers, who start as beginners, achieve USFA "A" rating and become nationally ranked. Several attend prestigious universities such as Yale, Johns Hopkins, Duke, MIT, Northwestern University, and Purdue. Ina also coaches some of our older members who enjoy success at local and national levels. Coach Fernando is the US Fencing Association Illinois Division Chair and Head Fencing Coach of the Stevenson High School fencing program. He has 30 years of coaching experience. Many of his athletes achieve great success at national levels. He is available for private lessons in foil or saber. Bob Baldwin, IFC President, retired technical business magazine editor, began fencing in 1954 at the Kansas City Fencing Club. He fenced for the Detroit Fencers Club and Halberstadt Fencers Club (San Francisco) before joining IFC in the mid1970s. He is a nationally ranked veteran fencer. Ina Harizanova, IFC Vice-President and Director of Youth Programs. 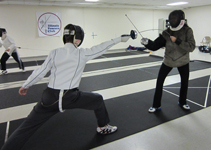 John Lartz, IFC treasurer, an attorney, is a nationally ranked competitor who began his fencing career at Purdue University, John competes on the local and national level and helps fencers in our youth program.